Moisture content in a strongly hydrophilic ion-exchange resin is one of the key parameters in commercial production of ion-exchange membranes. This work tried to clarify the effect of moisture content in an anion-exchange resin (AER) on the structure and final properties of anion-exchange membranes (AEMs). The AER was modified to 2, 4, 6, and 8% of moisture and then ground. The modified AER was blended with polyethylene and extruded to prepare AEMs, some of which were hot pressed. The microstructure and electrochemical properties of the AEMs were then determined. 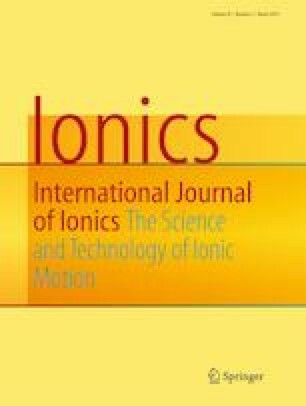 Variations in electrochemical properties showed no definite moisture effect except ion-exchange capacity, which decreased as AER moisture increased. The differences in changes in electrochemical properties were most apparent between pressed and non-pressed AEMs. Permselectivity and ionic resistance behaved similarly with AEM fixed ion concentration. The ionic resistance decreased with increasing fixed ion concentration. The same was true for permselectivity which is, however, in contradiction to Donnan theory. The online version of this article ( https://doi.org/10.1007/s11581-019-02984-9) contains supplementary material, which is available to authorized users. The work was carried out within the framework of the project No. LO1418 “Progressive development of Membrane Innovation Centre” supported by the program NPU I Ministry of Education Youth and Sports of the Czech Republic, using the infrastructure Membrane Innovation Centre.